http://grameenscotland.com : Ever since Glasgow University welcomed Yunus as the 21st C Adam Smith, at the 2008 quarter of a millennium celebrations - Glasgow has arrived as one of the 3 great academic (Kyushu Japan, 100 southern usa university consortium of SB studentcompetitions) and pro-youth economics partners of Nobel Laureate Muhammad Yunus . It has started up 2 journals of Social Business in 2010 as well as Glasgow Caledonian investment in the second social business professorship (first on healthcare and microcredit), the virtually free nursing college and from October 2012 Yunus as Chancellor. 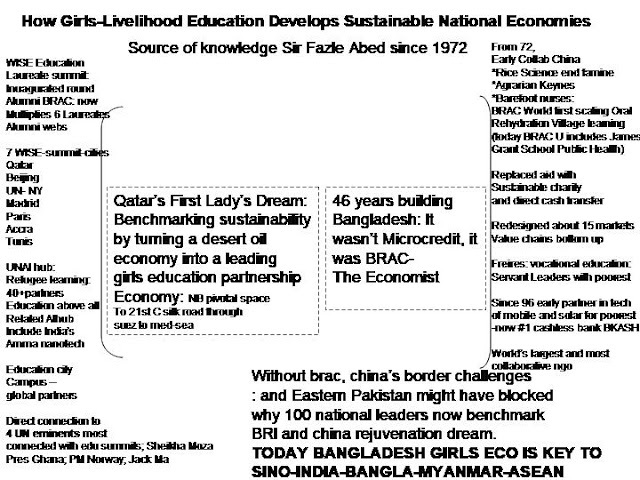 Of course, just as Scotland became one of the first worldwide diaspora nations we aim to maintain the most uptodate collaboration entrepreneur partner maps with Yunus and his 50 most exciting youth projects around the world of investing in net generation's co-production of millennium goals. For example down south in London, Yunus inspires the great microenergy awards network championed by Prince Charles and Lord Sainsbury's eldest daughter http://ashden.org/ and his briefings 1 2 3 of staff at The Economist are world famous among leaders celebrating the 40th year of the magazine's genre of net generation Entrepreneurial Revolution and 170 year since Scot James Wilson started the world's number 1 end hunger viewspaper mediating sustainability of cross-cultural commonwealth. 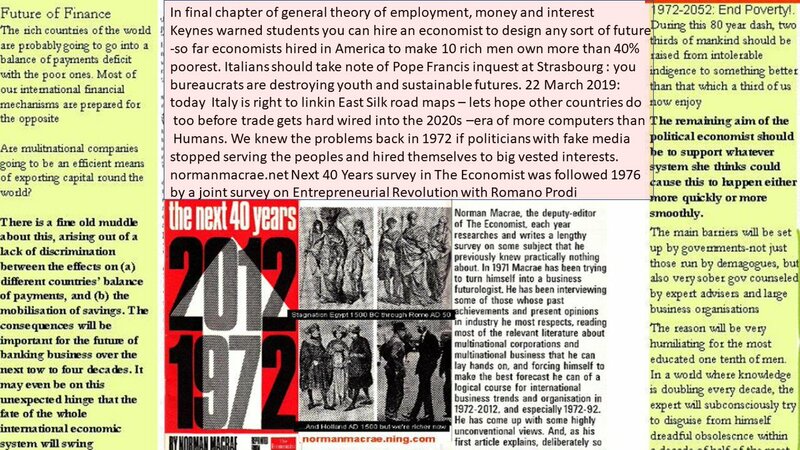 Scot, Norman Macrae, was The Economist's Unacknowledged Giant. His foundation celebrates pro-youth economics whereverfriends of Norman's Entrepreneurial Revolution(Year 40 ) links It is our particular joy to celebrate and help sponsor student SB and jobs competitions with youth and Nobel Laureate Muhammad Yunus. What Futures do Net Generation and Yunus Investors want to spend life times working on? Nobel Peace Prize Laureate Muhammad Yunus believes "Poverty is Unnecessary," that it's a man-made problem that can be eradicated. On October 25th, every year Whole Planet Foundation® celebrates Poverty is Unnecessary Day and our anniversary (can you believe it's been seven years?!) and to recognize the support from the brands that donate $25,000 annually to support the foundation’s mission. Whole Planet Foundation's Poverty is Unnecessary Fund provides expansion funds for new microlending projects through a $25,000 annual donation. BlueAvocado, Kettle Brand Chips, Cafe Spice, Genji Sushi, LÄRABAR, ProBar, Mrs. Meyer's Clean Day, Nature's Path, and Odwalla all made this commitment to support our mission this year. Join us in sending them a big THANK YOU. Meet microentrepreneurs Selvam, Sreeja and Sindhu. They are clients of our partner Microcredit Initiative of Grameen in India. The generosity of our supporters helps microentrepreneurs like them gain access to capital, enabling them to create or expand their home-based businesses. To date, the Poverty is Unnecessary Fund has contributed $225,000, creating over 1,300 microcredit loans based on the average first loan size of $164 in the developing world and empowering over 8,000 people with the opportunity to change their own lives. Be sure not to miss events going on at your local Whole Foods Market stores on October 25th. To celebrate the support of our partners, stores will have special displays, coupons, products and tastings of each of the brands that are a part of the Poverty is Unnecessary Fund. Learn more about events in your area. The 2013 calendar will be hitting stores very soon! The $3 calendar features over $40 in coupons from 25 different suppliers and includes great photos of microentrepreneurs from 12 different countries. Thanks to sponsorships from Whole Foods Market’s supplier partners, 100% of the proceeds from calendar sales go directly toward providing microlending support in more than 50 countries around the world. CAURIE Microfinance provides small solidarity–based loans to over 40,000 women across rural Senegal. The CAURIE mission is to contribute to the economic and social support of poor micro-entrepreneurs, principally women, by offering them appropriate financial products and services. In order to meet the needs of the rural poor, CAURIE works through village groups that are organized and managed as Village Banks with on average 50 women per group. The groups are always self-selected, and their leadership is elected by the members in order to best lead a loan group that relies on solidarity collateral. Membership is always voluntary as long as they meet the commitments laid out at the start of the program. CAURIE was started by Catholic Relief Services and Caritas Senegal in 1999 and became an independent institution in 2005. The institution is based in Thies, Senegal about one hour outside of the capital of Dakar. They now provide financial services to an ever-growing number of rural clients at with an exceptionally high level of portfolio quality. Aichetou is a microcredit client of our partner CAURIE in Senegal. She has her own beauty salon in her village. The 2013 Whole Planet Foundation calendar features photos and stories of clients like Aichetou from all over the world including Bolivia, India, Indonesia, Mexico, Morocco, Peru, Rwanda, Samoa, Senegal, Thailand, the United States and Vietnam. These microentrepreneurs have used their microloans to start or expand their home-based businesses in small-scale farming, neighborhood shops and textiles. A HUGE thank you to all the Whole Foods Market supplier partners who sponsor the calendar that allow us to ensure that 100% of all proceeds from the sales of this calendar go to the field. We'd like to personally thank Alexia Foods, Allegro Coffee Company, Annie Chun's, Back to Nature, Cocoa Well, Earth's Best, Garden of Life, Happy Family Organic Superfoods, Ito En, Honest Tea, If You Care, Izze, Kashi, Kit's Organic, Lake Chaplin Chocolates, Lucini, Mambo Sprouts, Mega Food, Muir Glen Organic, MyChelle, Naked Juice, Nature's Path, Nordic Naturals, Organic Valley, Raw Revolution, Saffron Road, Seventh Generation, Stacy's, Tasty Bite, Traditional Medicinals, Whole Foods Market and Zevia. Visit our calendar page for more information.